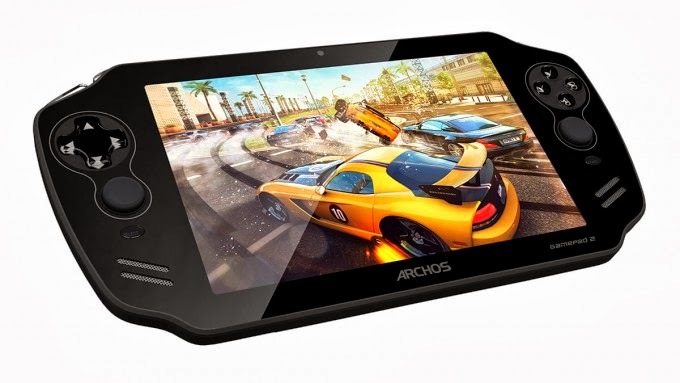 Archos’s first attempt to enter the ‘gaming tablet’ market was way back in 2012 (a huge year in terms of tech), with its original GamePad – though it didn’t quite work for me, unfortunately. Many moons on though, and I’ve managed to get my hands on the French-based manufacturer’s GamePad 2, which carries a ton of improvements to both design and power when compared to its predecessor. At first glance, the GamePad 2 could easily be mistaken as a Sony PS Vita or PSP. It is only really distinguished by an a larger form-factor and the Archos logo which has been nicely placed under the tablet’s respectable 7- inch display. The tablet is reassuringly solid and comes in at 200.5 mm x 154 mm x 9.9 mm, weighing 400g. You’d think an Android tablet weighing 400g would be pretty heavy to hold, compared to Google’s Nexus 7 which is actually over 100g lighter, though surprisingly, the GamePad 2 has a nice weight to it. As well as this, it’s solid and sports slightly curved sides which add to a tight and sustainable grip. Looking around the GamePad 2, you’ll find the usual ports and buttons (power/lock button, volume rocker, 3.5mm headphone jack, micro-USB charging port and the added extra of a mini-HDMI), along with some physical gameplay controls such as a D-pad and two analogue sticks – just like the PS Vita. With the GamePad, you get a 7- inch panel which offers up a 1080p resolution. I did a few tests to determine the quality of the GamePad 2’s display, and have to say that I think it’s rather impressive, with an excellent colour balance – a huge improvement when compared to the original GamePad. The GamePad 2 has been pre-loaded with Google’s Android 4.2 Jelly Bean operating system – not KitKat – and features a more stock experience, with little design input from Archos. Personally, I don’t mind this, however it would’ve been nice to have seen some sort of software customisation. Archos hasn’t just improved the overall design and display of the GamePad 2, as you also get a 1.6GHz quad-core processor that is much faster than the original GamePad – though clearly not as whizzy as the Advent Tegra Note’s Tegra 4 processor as touted by some of its rivals. In terms of memory, you’re able to choose from 8GB and 16GB options, although you can easily expand the memory, either way, as you’re able to make use of the micro-SD card slot. In fact, if you can get an extra 64GB this way, which means you wouldn’t necessarily need to splash out on the more expensive 16GB model just to get an ample amount of space to store your apps and games. The 5000mAh battery was also great when it came to actually using and testing the GamePad 2, providing plenty of power for browsing the web, updating my Facebook status and playing a few games. If you intend on purchasing the Archos GamePad 2, then you would’ve obviously been attracted by its gaming abilities and how it sports full gaming controls – which is unique for an Android tablet. The GamePad 2 has been highly supported by Gameloft, who are known for wide variety of licensed movie-based and other games, providing the tablet with access to a range of different titles -including Modern Combat and Asphalt 8, which have been pre-installed and don’t cost you a penny. Testing out the gaming capabilities of the GamePad 2, I was very impressed with the updated D-pad and analogue sticks, and found the mapping feature very useful when it came to playing a number of different titles from the Play Store. The GamePad 2 is a fine Android tablet in terms of power and overall performance, and is a huge improvement over its predecessor – perfect if you’re someone who’s obsessed with games. Whether you need it over a more conventional tablet, it is a decision that only you can make.